This article is about the social phenomenon. For other uses, see White flight (disambiguation). White flight is a term that originated in the United States, starting in the 1950s and 1960s, and applied to the large-scale migration of people of various European ancestries from racially mixed urban regions to more racially homogeneous suburban or exurban regions. The term has more recently been applied to other migrations by whites, from older, inner suburbs to rural areas, as well as from the U.S. Northeast and Midwest to the milder climate in the Southeast and Southwest. The term has also been used for large-scale post-colonial emigration of whites from Africa, or parts of that continent, driven by levels of violent crime and anti-colonial state policies. Migration of middle-class white populations was observed during the Civil Rights Movement in the 1950s and 1960s out of cities such as Cleveland, Detroit, Kansas City and Oakland, although racial segregation of public schools had ended there long before the US Supreme Court's decision Brown v. Board of Education in 1954. In the 1970s, attempts to achieve effective desegregation (or "integration") by means of forced busing in some areas led to more families' moving out of former areas. More generally, some historians suggest that white flight occurred in response to population pressures, both from the large migration of blacks from the rural South to urban northern and western cities in the Great Migration and the waves of new immigrants from around the world. However, some historians have challenged the phrase "white flight" as a misnomer whose use should be reconsidered. In her study of West Side in Chicago during the post-war era, historian Amanda Seligman argues that the phrase misleadingly suggests that whites immediately departed when blacks moved into the neighborhood, when in fact, many whites defended their space with violence, intimidation, or legal tactics. Leah Boustan, Professor of Economics at Princeton, attributes white flight both to racism and economic reasons. The business practices of redlining, mortgage discrimination, and racially restrictive covenants contributed to the overcrowding and physical deterioration of areas where minorities chose to congregate. Such conditions are considered to have contributed to the emigration of other populations. The limited facilities for banking and insurance, due to a perceived lack of profitability, and other social services, and extra fees meant to hedge against perceived profit issues, increased their cost to residents in predominantly non-white suburbs and city neighborhoods. According to the environmental geographer Laura Pulido, the historical processes of suburbanization and urban decentralization contribute to contemporary environmental racism. In the United States during the 1940s, for the first time a powerful interaction between segregation laws and race differences in terms of socioeconomic status enabled white families to abandon inner cities in favor of suburban living. The result was severe urban decay that, by the 1960s, resulted in crumbling "ghettos". Prior to national data available in the 1950 US census, a migration pattern of disproportionate numbers of whites moving from cities to suburban communities was easily dismissed as merely anecdotal. Because American urban populations were still substantially growing, a relative decrease in one racial or ethnic component eluded scientific proof to the satisfaction of policy makers. In essence, data on urban population change had not been separated into what are now familiarly identified its "components." The first data set potentially capable of proving "white flight" was the 1950 census. But original processing of this data, on older-style tabulation machines by the US Census Bureau, failed to attain any approved level of statistical proof. It was rigorous reprocessing of the same raw data on a UNIVAC I, led by Donald J. Bogue of the Scripps Foundation and Emerson Seim of the University of Chicago, that scientifically established the reality of white flight. It was not simply a more powerful calculating instrument that placed the reality of white flight beyond a high hurdle of proof seemingly required for policy makers to consider taking action. Also instrumental were new statistical methods developed by Emerson Seim for disentangling deceptive counter-effects that had resulted when numerous cities reacted to departures of a wealthier tax base by annexation. In other words, central cities had been bringing back their new suburbs, such that families that had departed from inner cities were not even being counted as having moved from the cities. During the later 20th century, industrial restructuring led to major losses of jobs, leaving formerly middle-class working populations suffering poverty, with some unable to move away and seek employment elsewhere. Real estate prices often fall in areas of economic erosion, allowing persons with lower income to establish homes in such areas. Since the 1960s and changed immigration laws, the United States has received immigrants from Mexico, Central and South America, Asia, and Africa. Immigration has changed the demographics of both cities and suburbs, and the US has become a largely suburban nation, with the suburbs becoming more diverse. In addition, Latinos, the fastest growing minority group in the US, began to migrate away from traditional entry cities and to cities in the Southwest, such as Phoenix and Tucson. In 2006, the increased number of Latinos had made whites a minority group in some western cities. In some areas, the post–World War II racial desegregation of the public schools catalyzed white flight. In 1954, the US Supreme Court case Brown v. Board of Education (1954) ordered the de jure termination of the "separate, but equal" legal racism established with the Plessy v. Ferguson (1896) case in the 19th century. It declared that segregation of public schools was unconstitutional. Many southern jurisdictions mounted massive resistance to the policy. In some cases, white parents withdrew their children from public schools and established private religious schools instead. These schools, termed segregation academies, sprung up in the American South between the late 1950s and mid-1970s and allowed parents to prevent their children from being enrolled in racially mixed schools. In studies in the 1980s and 1990s, blacks said they were willing to live in neighborhoods with 50/50 ethnic composition. Whites were also willing to live in integrated neighborhoods, but preferred proportions of more whites. Despite this willingness to live in integrated neighborhoods, the majority still live in largely segregated neighborhoods, which have continued to form. Until 1980, the former British dependency of Rhodesia held a well-publicised image as being one of two nations in sub-Saharan Africa where a white minority of European descent and culture held political, economic, and social control over a preponderantly black African majority. Nevertheless, unlike white South Africans, a significant percentage of white Rhodesians represented recent immigrants. Initially, about three-fourths of resident whites were of British origin, with those from England and Wales predominating. After World War II there was a substantial influx of the British diaspora, including former colonials from India, Pakistan, and other British possessions in Africa. Also represented were working-class Englishmen responding to economic opportunities. In 1969 only 41% of Rhodesia's white community were natural-born citizens, or 93,600 people. The remainder were naturalised British and South African citizens or expatriates, with many holding dual citizenship. During the Rhodesian Bush War, almost the entire white male population between eighteen and fifty-eight was affected by various military commitments, and individuals spent up to five or six months of the year on combat duty away from their normal occupations in the civil service, commerce, industry, or agriculture. These long periods of service in the field led to an increased emigration of men of military age. In November 1963, state media cited the chief reasons for emigration as uncertainty about the future, economic decline due to embargo and war, and the heavy commitments of national service, which was described as "the overriding factor causing people to leave". Of the male emigrants in 1976 about half fell into the 15 to 39 age bracket. Between 1960 and 1976 160,182 whites immigrated, while 157,724 departed. This dynamic turnover rate led to depressions in the property market, a slump in the construction industry, and a decline in retail sales. The number of white Rhodesians peaked in 1975 at 278,000 and rapidly declined as the bush war intensified. In 1976 around 14,000 whites left the country, marking the first year since Rhodesia's Unilateral Declaration of Independence in 1965 that more whites had left the country than arrived, with most leaving for South Africa. This became known as the 'chicken run', the earliest use of which was recorded the following year, often by Rhodesians who remained to contemptuously describe those who had left. Other phrases such as 'taking the gap' or 'gapping it' were also used. As the outward flow increased, the phrase 'owl run' also came into use as leaving the country was deemed by many to be a wise choice. Disfavour with the biracial Zimbabwe Rhodesia administration in 1979 also contributed to a mass exodus. The establishment of the new Republic of Zimbabwe in 1980 sounded the death knell for white political power and ushered in a new era of black majority rule. White emigration peaked between 1980 and 1982 at 53,000 persons, with the breakdown of law and order, an increase in crime in the rural areas, and the provocative attitude of Zimbabwean officials being cited as the main causes. Political conditions typically had a greater impact on the decision to migrate among white than black professionals. Between 1982 and 2000 Zimbabwe registered a net loss of 100,000 whites, or an average of 5,000 departures per year. A second wave of white emigration was sparked by President Robert Mugabe's violent land reform programme after 2000. Popular destinations included South Africa and Australia, which emigrants perceived to be geographically, culturally, or sociopolitically similar to their home country. A 2007 government report stated that immigration in Dublin has caused "dramatic" white flight from elementary schools in a studied area (Dublin 15). 27% of residents were foreign-born immigrants. The report stated that Dublin was risking creating immigrant-dominated banlieues, on the outskirts of a city, similar to such areas in France. The immigrants in the area included Eastern Europeans (such as those from Poland), Asians, and Africans (mainly from Nigeria). White flight in Norway has increased in the 1970s with the immigration of non-Scandinavians from (in numerical order, starting with the largest): Poland, Pakistan, Iraq, Somalia, Vietnam, Iran, Turkey, Bosnia and Herzegovina, Russia, Sri Lanka, the Philippines, the former Yugoslavia, Thailand, Afghanistan, and Lithuania. By June 2009, more than 40% of Oslo schools had an immigrant majority, with some schools having a 97% immigrant share. [unreliable source?] Schools in Oslo are increasingly divided by ethnicity. For instance, in the Groruddalen (Grorud valley), four boroughs which currently has a population of around 165,000, the ethnic Norwegian population decreased by 1,500 in 2008, while the immigrant population increased by 1,600. In thirteen years, a total of 18,000 ethnic Norwegians have moved from the borough. According to researcher Emma Neuman at Linnaeus University, the white flight phenomenon commences when the fraction of non-European immigrants reaches 3-4% but European immigration show no such effect. High income earners and the highly educated move out first, so the ethnic segregation also leads to class segregation. In a study performed at Örebro University, mothers of young children were interviewed to study attitudes on swedishness, multiculturalism and segregation. It concluded that while many expressed values as ethnic diversity being an enriching factor, but when in practice it came to choosing schools or choosing district to move to, ensuring the children had an access to a school with robust Swedish majority as they didn't want their children to grow up in a school as a minority and wanted them to be in a good Swedish language learning environment. In Sydney, Australian-born minority (white and non-white) in Fairfield and Canterbury fell by three percentage points, six percentage points in Auburn, and three percentage points in Strathfield between 1991 and 1996. Only in Liverpool, one of the more fast growth areas of Sydney, did both the Australia-born and overseas-born male population increase over the 1991-1996 period. However, the rate of growth of the overseas-born was far greater than that of the Australia-born, thus the sharp increase in Liverpool's population share from 43.5 per cent to 49 per cent by 1996. The Australia-born movers from the south-western suburbs relocated in Penrith to northwest and Gosford and Wyong in the northeast. In 2018, NSW Labor Opposition leader Luke Foley talked about White flight, although he later apologised for the comments. ^ Schaefer, Richard T., ed. (2008). The Encyclopedia of Race, Ethnicity, and Society. SAGE publications. ^ "white flight". Merriam-Webster Dictionary. ^ Armor, David J. (1986). Forced Justice: School Desegregation and the Law. Oxford University Press US. ISBN 978-0-1953-58179. ^ Joshua Hammer (May–June 2010). "(Almost) Out of Africa: The White Tribes". World Affairs Journal. ^ Johnson, RW (October 19, 2008). "Mosiuoa 'Terror' Lekota threatens to topple the ANC". The Times. London. ^ Christopher, A.J. (2000). The atlas of changing South Africa (2nd ed.). Routledge. p. 213. ISBN 978-0-2031-85902. ^ Bradshaw, York W.; Ndegwa, Stephen N., eds. (2001). The uncertain promise of Southern Africa. Indiana Univ. Press. p. 6. ^ Reinhardt, Steven G.; Reinhartz, Dennis P., eds. (2006). Transatlantic history (1st ed.). Texas A&M University Press. pp. 149–150. ISBN 978-1-5854-44861. ^ a b "White flight from South Africa: Between staying and going". The Economist. September 25, 2008. ^ Clotfelter, Charles T. (2004). After Brown: The Rise and Retreat of School Desegregation. Princeton University Press. ^ Ravitch, Diane (1983). The Troubled Crusade: American Education, 1945–1980. New York City: Basic books. ISBN 978-0-4650-87570. ^ Seligman, Amanda (2005). Block by block: neighborhoods and public policy on Chicago's West Side. Chicago: University of Chicago Press. pp. 213–14. ISBN 978-0-226-74663-0. ^ Boustan, Leah (2017-05-15). "The Culprits behind White Flight". The New York Times. ISSN 0362-4331. Retrieved 2017-05-15. ^ Kruse, Kevin M. (2007). White Flight: Atlanta and the Making of Modern Conservatism. Princeton, N.J.: Princeton University Press. ISBN 978-0-691-13386-7. Archived from the original on June 10, 2007. Retrieved February 5, 2007. ^ Thabit, Walter (2003). How East New York Became a Ghetto. New York: New York University Press. p. 42. ISBN 978-0-8147-8267-5. ^ Pulido, Laura (Mar 2000). "Rethinking Environmental Racism: White Privilege and Urban Development in Southern California" (PDF). Annals of the Association of American Geographers. 90 (1): 12–40. doi:10.1111/0004-5608.00182. hdl:10214/1833. ^ Bogue, Donald J. and Emerson Seim (Sept-Dec 1956) Components of Population Change in Suburban and Central City Populations of Standard metropolitan Areas: 1940 to 1950 Rural Sociology. ^ Bogue, Donald J. (1957) Components of Population Change, 1940–1950 published jointly by Scripps Foundation for Research in Population Problems: Miami University, and Population Research and Training Center: University of Chicago, esp. p. iv. Reprinted, in part for the value of the statistical methods, in Gibbs, Jack P. (1961) Urban Research Methods D. Van Norstrand Company: Princeton, NJ. ^ Asthana, Anushka (August 21, 2006). "Changing Face of Western Cities: Migration Within U.S. Makes Whites a Minority in 3 More Areas". Washington Post. ^ Crossney, Kristen; Bartelt, David (December 1, 2005). "Residential Security, Risk, and Race: The Home Owners' Loan Corporation and Mortgage Access in Two Cities". Urban Geography. 26 (8): 707–736. doi:10.2747/0272-3638.26.8.707. Archived from the original on July 9, 2012. Retrieved April 12, 2008. ^ Crossney; Bartelt. "2006 Housing Policy Debate" (PDF). Archived from the original (PDF) on April 14, 2008. "Recommended restrictions should include provisions for: prohibition of the occupancy of properties except by the race for which they are intended. ... Schools should be appropriate to the needs of the new community, and they should not be attended in large numbers by inharmonious racial groups." —Federal Housing Administration, Underwriting Manual: Underwriting and Valuation Procedure Under Title II of the National Housing Act With Revisions to February, 1938 (Washington, D.C.), Part II, Section 9, Rating of Location. ^ Wheeler, James O. (1976). "Locational Dimensions of Urban Highway Impact: An Empirical Analysis". Geografiska Annaler. Series-B, Human Geography. 58 (2): 67–78. doi:10.1080/04353684.1976.11879413. JSTOR 490613. ^ Connerly, C. E. (December 1, 2002). "From Racial Zoning to Community Empowerment: The Interstate Highway System and the African American Community in Birmingham, Alabama". Journal of Planning Education and Research. 22 (2): 99–114. doi:10.1177/0739456X02238441. ^ Ford, Richard Thompson (2008). The Race Card: How Bluffing about Bias Makes Race Relations Worse (1st ed.). New York: Farrar, Straus and Giroux. pp. 290–291. ISBN 9780374245757. ^ Hirsch, Arnold R. "Blockbusting". Encyclopedia of Chicago History. ^ Andersen, Hans Skifter (2003). Urban Sores: On the Interaction Between Segregation, Urban Decay, and Deprived Neighbourhoods. Burlington, VT: Ashgate. ISBN 978-0-7546-3305-1. ^ Wilson, William Julius (1997). When Work Disappears: The World of the New Urban Poor. New York City: Vintage Books. ISBN 978-0-679-72417-9. ^ Borsuk, by Alan J. (July 8, 2006). "Mayor served 'the public welfare': Longtime city icon known for integrity, energy, principles]". Journal Sentinel. Archived from the original on July 11, 2006. ^ Rast, J. (1 September 2006). "Governing the Regimeless City: The Frank Zeidler Administration in Milwaukee, 1948-1960". Urban Affairs Review. 42 (1): 81–112. doi:10.1177/1078087406289734. ^ Curran, Donald J. Curran (February 1964). "Infra-Metropolitan Competition". Land Economics. 40 (1): 94–99. doi:10.2307/3144466. JSTOR 3144466. ^ Clotfelter, Charles T. (2004). After Brown: The Rise and Retreat of School Desegregation. Princeton, NJ: Princeton University Press. pp. 101–109. ^ "From the Old Order to the New Order–Reasons and Results, 1957-1997". Baltimore City Public School System. Archived from the original on January 2, 2004. ^ Jacobson, Cardell K. (1978). "Desegregation Rulings and Public Attitude Changes: White Resistance or Resignation?". American Journal of Sociology. 84 (3): 698–705. doi:10.1086/226833. JSTOR 2778261. ^ Nevius, C.W. (September 9, 2007). "Racism alive and well in S.F. schools – here's proof". San Francisco Chronicle. ^ Ryan, John. "Tackling Local Resistance to Public Schools" (PDF). Daily Journal. ^ Zhang, J. (2011). "Tipping and Residential Segregation: A Unified Schelling Model". Journal of Regional Science. 51: 167–193. CiteSeerX 10.1.1.564.9435. doi:10.1111/j.1467-9787.2010.00671.x. ^ Schelling, T. (1969). "Models of segregation". The American Economic Review. 59 (2): 488–493. ^ "We’re running out of whites." ^ "South Africa: Tomorrow’s Zimbabwe: This history is about to be replayed in South Africa. Whites have been leaving the country for some time now, worried about crime and instability." ^ "“We are quickly losing all our skilled workers. One option for South Africa is to employ a foreign workforce to continue growing our economy and we all know how many South Africans feel about that,” Waldorf said." ^ Johnson, Scott (February 14, 2009). "Fleeing From South Africa". Newsweek. Archived from the original on July 28, 2011. ^ a b c d e f g h i Nelson, Harold D, ed. (1983). Zimbabwe, a Country Study. Area Handbook Series (Second ed.). Washington, D.C.: Department of the Army, American University. OCLC 227599708. ^ a b c Raeburn, Michael. We are everywhere: Narratives from Rhodesian guerillas. pp. 200–209. ^ Smith, Ian (1997). The Great Betrayal. London: Blake Publishing Ltd. pp. 368–409. ISBN 978-1-85782-176-5. ^ a b Driouchi, Ahmed (2014). Labor and Health Economics in the Mediterranean Region: Migration and Mobility of Medical Doctors. Hershey: IGI Global. pp. 340–345. ISBN 978-1466647237. ^ Rangvid, B. S. (2009). "School Choice, Universal Vouchers and Native Flight from Local Schools". European Sociological Review. 26 (3): 319–335. doi:10.1093/esr/jcp024. ^ "Report finds evidence of 'white flight' from immigrants in northwest Dublin". International Herald Tribune. October 19, 2007. Archived from the original on October 24, 2007. Retrieved April 20, 2011. ^ "40 prosent av Osloskolene har innvandrerflertall" (in Norwegian). ^ Lundgaard, Hilde (August 22, 2009). "Foreldre flytter barna til 'hvitere' skoler" [Parents moving kids to 'whiter' schools]. Aftenposten (in Norwegian). Archived from the original on August 26, 2009. Retrieved March 25, 2010. ^ Slettholm, Andreas (December 15, 2009). "Ola og Kari flytter fra innvandrerne". Aftenposten (in Norwegian). ^ a b "Noen barn er brune". Nettavisen. January 15, 2010. ^ Ringheim, Gunnar; Fransson, Line; Glomnes, Lars Molteberg (January 14, 2010). "Et stort flertall av barna er brune". Dagbladet (in Norwegian). ^ Bråmå, Åsa (2006). "'White flight'? The production and reproduction of immigrant concentration areas in Swedish cities, 1990–2000". Urban Studies. 43 (7): 1127–1146. CiteSeerX 10.1.1.1004.4968. doi:10.1080/00420980500406736. ^ a b c "Segregeringen ökar i Sverige". Forskning & Framsteg (in Swedish). Retrieved 2017-08-16. ^ Porter, Roy (1994). London: A Social History. Cambridge, MA: Harvard University Press. pp. 132, 140. ^ "Census 2001: Ethnicity". BBC News. ^ Johnston, Philip (February 10, 2005). "Whites 'leaving cities as migrants move in'". The Telegraph. ^ Dominic Casciani (September 4, 2006). "So who's right over segregation?". BBC News Magazine. Retrieved September 21, 2006. ^ "'White flight' from Aussie public schools". Sydney Morning Herald. March 10, 2008. ^ "NSW Labor leader apologises for 'white flight' migration comments". 2018-05-24. ^ "Luke Foley blasted for 'white flight' comments". ^ Davies, Anne (2018-05-24). "Luke Foley apologises for 'white flight' comment, saying he now knows it's offensive". The Guardian. ^ Garret-Walker, Hana (June 18, 2012). "Claim of 'white flight' from low decile schools". The New Zealand Herald. ^ "Some Pakeha parents stereotyping Maori pupils – principals". Radio New Zealand. June 19, 2012. ^ Collins, Simon (July 24, 2006). "'White flight' threatens school". The New Zealand Herald. Retrieved September 22, 2011. Andersson, Roger (2007). Schönwälder, Karen, ed. "Ethnic residential segregation and integration processes in Sweden" (PDF). 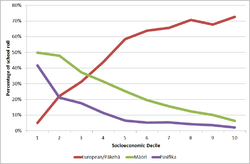 Residential Segregation and the Integration of Immigrants: Britain, the Netherlands and Sweden. Social Science Research Center Berlin: 61–90. Avila, Eric (2005). Popular Culture in the Age of White Flight: Fear and Fantasy in Suburban Los Angeles. Berkeley: University of California Press. ISBN 978-0-520-24811-3. Finney, Nissa; Simpson, Ludi (2009). 'Sleepwalking to segregation'? : Challenging myths about race and migration. Bristol: Policy Press. ISBN 9781847420077. Gamm, Gerald (1999). Urban Exodus: Why the Jews Left Boston and the Catholics Stayed. Harvard University Press. Kruse, Kevin M. (2007). White Flight: Atlanta and the Making of Modern Conservatism. Princeton, N.J.: Princeton University Press. ISBN 978-0691133867. Lupton, R.; Power, A. (2004). "Minority Ethnic Groups in Britain" (PDF). CASE-Brookings Census Brief (2). Pietila, Antero (2010). Not in My Neighborhood: How Bigotry Shaped a Great American City. Chicago: Ivan R. Dee. ISBN 978-1566638432. Schneider, J. (30 May 2008). "Escape From Los Angeles: White Flight from Los Angeles and Its Schools, 1960-1980". Journal of Urban History. 34 (6): 995–1012. doi:10.1177/0096144208317600. Sugrue, Thomas J. (2005). The Origins of the Urban Crisis: Race and Inequality in Postwar Detroit. Princeton: Princeton University Press. ISBN 978-0-691-12186-4. Tarasawa, Beth (January 19, 2009). "New Patterns of Segregation: Latino and African American Students in Metro Atlanta High Schools]". Southern Spaces. 2009. doi:10.18737/M7BC8G. Wiese, Andrew (2006). "African American Suburban Development in Atlanta". Southern Spaces. 2006. doi:10.18737/M7CP4C.